The Grid Detail Module allows you to organize the information displayed according to its significance. It’s a complementary application that displays the data in a detailed Form. In order to see the Grid Detail within the Grid the final user needs to click on that is displayed for each record. In this section, the user can define how the detail of a particular record should be displayed when it’s selected and which registry information should be displayed in this detail. Fields selection for the detail page. : Allows you to select the desired fields. Just click the field and then click the “On/Off” button to enable/disable the fields. Through this interface you can chose the fields that will be part of the “WHERE” clause, it will return the corrected information according to the selected record. 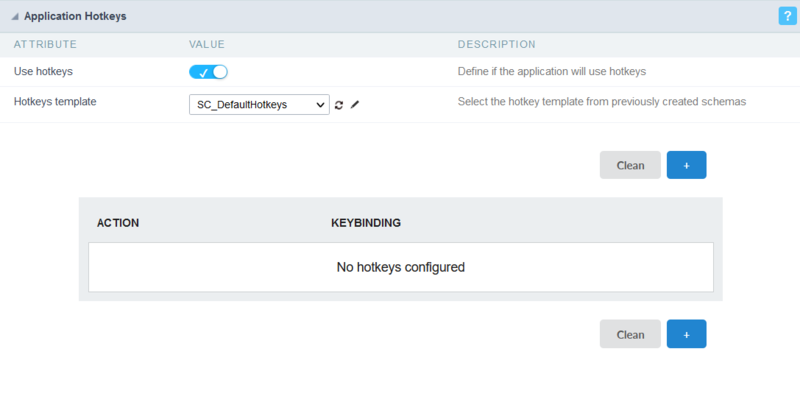 ScriptCase uses to identifies the table primary keys, that is being used within the application SQL, automatically. However, sometimes it is necessary to set the primary key manually, especially in cases where the application has a SQL JOIN, involving more than one table. On/Off : Select the field to be displayed in detail. The selected field (On) gets an asterisk. All : Check “On” to all fields. None : Check “Off” to all fields. The application toolbar is divided in two parts: superior and inferior. 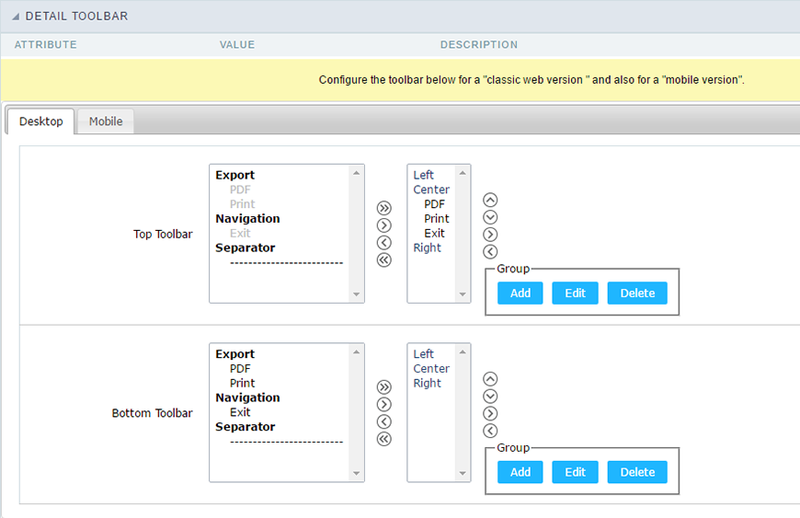 It is possible to select the buttons for each part independently. A button can even be part of both parts simultaneously. Exit : Ends or return to the previous application depending on how the “Display Detail” is configured. You can change the label within the “Button Settings”. Print : Creates a complete report with all Grid Detail data within a HTML printable page. 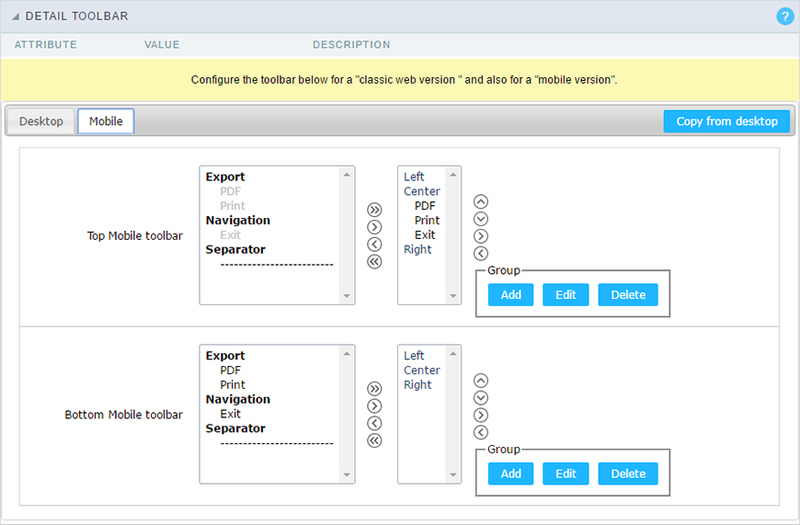 PDF : Creates a complete report with all Grid Detail data within a PDF file type. Separator : Creates a separation line between the buttons for better display, specially for grouped buttons. It has the same options of Desktop version, by adding only the item “copy of the desktop”, in which, when clicked, performs a copy of toolbar items from Desktop to Mobile. Button Displays the buttons available in the application. Label Allows you to customize the buttons name from current application. You can also use the option “Application Language” (placed within the main menu “Locales”) to change the button labels for the whole project. Hint Allows you to set a hint for the buttons. The hint will help the user to understand the button’s action. Shortcut key Allows you to set a shortcut key to run the button action. Important note: Each browser has its own shortcut combinations and reserved words, you need to check it before implementing this option. In this section is where the content variables that will be part of the header is set. This screen will change depending on the format chosen header within. Display Header : This flag determines whether the header is displayed. Detail Title : Using this option you can set a title for the application, it uses bring a value from the Grid application as default. However it can be customized. Field : When the “__Category” type option is chosen, it will open a Combobox next to the fields that are part of the “Select”. By choosing one of these fields, you are associating the value of the field to display in the header. 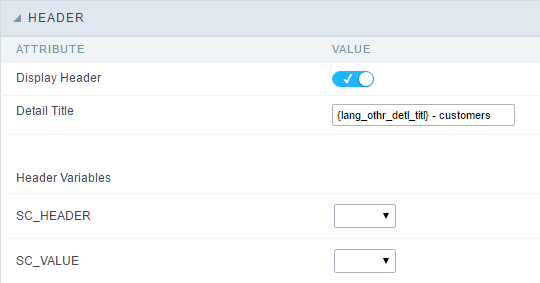 Title : When this option is selected, it will display the value filled in “Detail Title” to the header. Date : When you select the “Date” type, the system date in the format dd/mm/yyyy will be displayed in the header. There are several display formats using server date and time. The format can be reported in the text field that appears next. Click in the question mark to check out the available formats. Image : When the image type field is selected, a field for filling in the image name on the server will appear. To locate the existing images and select one, click on the “Choose Image” icon and to make new images available on the server click on “Download an image!” Configuração do rodapé da aplicação]cabecalho_up_img. Value : When “Value” type is selected, the content filled in the text field next to that will be displayed in the header, texts and “__ Global variables__” can be entered. Ex: “Name of the Employee: [v_name]”.